I like series. You may have noticed. Series are one of my favorite things because they stimulate both constancy and anticipation, both of which make my brain very happy. Last Summer, I did a series on this blog called "Thirsty Friday" where I blended, and juiced, and used enough paper straws to last a lifetime, and it is still one of my favorite things I have done on this site. Since we are now officially, in the depths of Summer, I felt that it was time for a new series. While I considered doing drinks again, I knew that nothing could possibly top this Watermelon & Raspberry Lemon Slushie, and I would really prefer to just drink glass after glass of that glorious pink slushie rather than trying to invent something better. I knew that this Summer needed something beyond drinks, it needed something gooey, toasted, and chocolate-filled. In the end, the choice was obvious - my very favorite and simplest Summer dessert. While I can easily pass up their cookies, I have to give the girl scouts my undying gratitude for the creation of the s'more. It is a true masterpiece, and the perfect balance of textures, flavors, and sweetness. While the classic trio is the height of perfection, last week, in my little kitchen, I met with a twist on perfection that nearly outdid its inspiration. Before an angry mob forms, all the fundamental elements of s'mores are present. Graham Crackers - No improvisation needed. Chocolate - White. I know, technically, it's not chocolate, but most of the reasonable world believes it is so let's call it chocolate. Buy the good stuff though, you will thank yourself. Marshmallows - Homemade and lemon; be fancy. 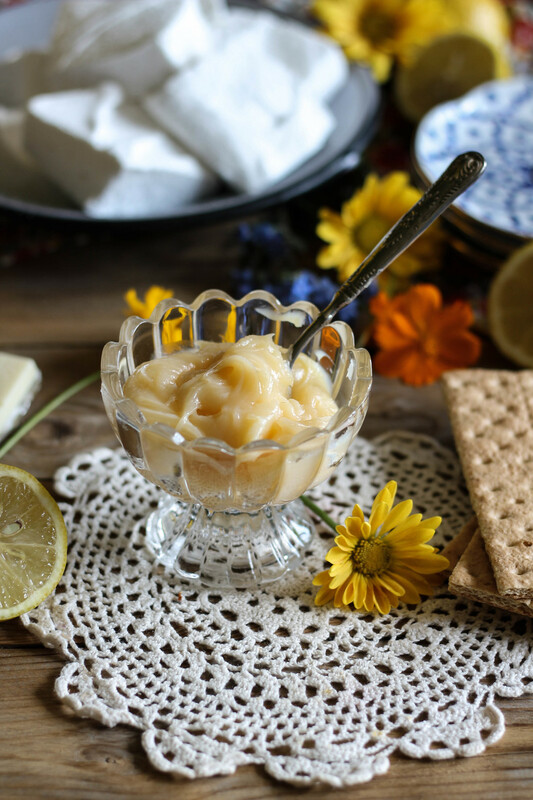 Bonus ingredient for and extra dose of heavenly flavor magic - Lemon curd. You get bonus points if you make it yourself. I like to do this operation in two sections. Section one being the graham cracker, lemon curd, and marshmallow, and section two comprising of the second half of graham cracker and the white chocolate. I toasted the top of my marshmallows with my kitchen torch and then went over the white chocolate ever-so-lightly to get it just a little melty. Toasted, smashed and ready to eat. I should probably mention that this is probably the messiest s'more you will ever bite into, but it is worth every bit of stickiness. This might just be the best s'more yet...and the Summer is just beginning. Be sure to check back each week this Summer for a new, creative twist on one of my favorite classics! Spread the lemon curd in an even layer over one of your graham cracker halves. Place the marshmallow on top and use a kitchen torch to toast the top of the marshmallow. Place the chocolate squares on the second half of the graham cracker and lightly run the flame of the torch over the chocolate, just until it begins to melt. Be sure to hold the flame high enough above the chocolate so it does not scorch. Place the chocolate half atop the toasted marshmallow and take the biggest bite you can! Enjoy! Cook’s note: You can certainly go the traditional route and toast your marshmallows over a campfire, however, I have just found that homemade marshmallows tend to melt quicker and more easily over an open flame. If you are making these for a group, try placing the graham cracker halves on a lined sheet pan with the marshmallows and chocolate facing up. Place the open s’mores in your oven (set to the broiler setting) and broil for 2-3 minutes, or until the marshmallows are toasted and the chocolate is just barely melted.